IMPORTANT STOP PRESS: There have been various comments concerning it being an April Fool because the Greek government has not yet updated its own official online documentation ...however we have also now been advised that the Greek government has since announced the delay is now until 9th May instead of 2nd May as they need the extra time to implement the tax - see photo (also attached below) - the only proof we are currently able to offer. 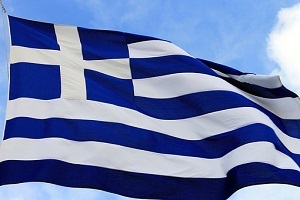 The long running saga of the Greek Cruising tax, known as the TEPAI, was due for implementation on 2 April 2019 following the first attempt to introduce it in 2014. 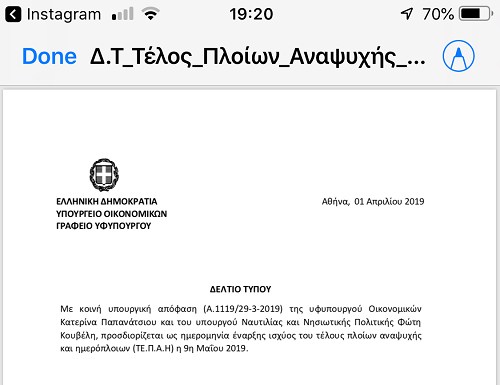 However, the Cruising Association (CA) reports that there has at last been a breakthrough regarding the TEPAI, with the Greeks agreeing to delay this new tax until 9th May. Yachts hauled out of the water are automatically deemed "Out of Use" - in their description, "Not in Greek Waters". There is no need to file your ship's papers when hauled out. This will remove a significant issue. Note: Yachts "Out of Use" but still in the water are required to file their ship's papers with Customs (Transit Log) or Port Police (DEKPA). Initially, you can back-pay tax if you "willingly" go and pay it, if you are found to be unpaid - and will therefore avoid a fine.